Oxymorphone HCl 5mg, 7.5mg, 10mg, 15mg, 20mg, 30mg, 40mg; ext-rel tabs. Use lowest effective dose for shortest duration. Individualize. Take on empty stomach. 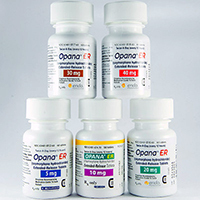 May give Opana as needed on an every 4–6hrs schedule; oxymorphone ext-rel tab is given on a continuous basis every 12hrs. ≥18yrs: Opioid-naive: Opana: 10–20mg every 4–6hrs as needed. Ext-rel tab: Swallow whole; 5mg every 12hrs, titrate by 5–10mg every 12hrs every 3–7 days; if breakthrough pain occurs: adjust dose or use a small-dose rescue medication (eg, immediate-release oxymorphone). Converting from Opana to ext-rel tab: Give half the total daily Opana dose as oxymorphone ext-rel every 12hrs. Conversion from other opioids: see full labeling. Mild hepatic impairment, renal impairment (CrCl <50mL/min), or elderly (≥65yrs): opioid-naive: initiate with 5mg dose; opioid-experience: initiate at 50% lower than normal starting dose and titrate slowly. Concomitant other CNS depressants: initiate at ⅓–½ of usual starting dose and monitor. Withdraw gradually by 25–50% every 2–4 days. Significant respiratory depression. Acute or severe bronchial asthma in an unmonitored setting or in the absence of resuscitative equipment. Known or suspected GI obstruction, including paralytic ileus. Moderate-to-severe hepatic impairment. Addiction, abuse, and misuse. Risk evaluation and mitigation strategy (REMS). Life-threatening respiratory depression. Accidental ingestion. Neonatal opioid withdrawal syndrome. Interaction with alcohol. Risks from concomitant use with benzodiazepines or other CNS depressants. Abuse potential (monitor). Life-threatening respiratory depression; monitor within first 24–72hrs of initiating therapy and following dose increases. Accidental exposure may cause fatal overdose (esp. in children). COPD, cor pulmonale, decreased respiratory reserve, hypoxia, hypercapnia, or pre-existing respiratory depression; monitor and consider non-opioid analgesics. Adrenal insufficiency. Head injury. Increased intracranial pressure, brain tumors; monitor. Seizure disorders. CNS depression. Impaired consciousness, coma, shock; avoid. Biliary tract disease. Acute pancreatitis. Drug and alcohol abusers. Renal or hepatic impairment. ER tabs: difficulty in swallowing or at risk for underlying GI disorders (eg, esophageal or colon cancer); consider other analgesics. Reevaluate periodically. Avoid abrupt cessation. Elderly. Cachectic. Debilitated. Pregnancy; potential neonatal opioid withdrawal syndrome during prolonged use. Labor & delivery, nursing mothers: not recommended. Avoid alcohol or alcohol-containing products. Increased risk of hypotension, respiratory depression, sedation with benzodiazepines or other CNS depressants (eg, non-benzodiazepine sedatives/hypnotics, anxiolytics, general anesthetics, phenothiazines, tranquilizers, muscle relaxants, antipsychotics, alcohol, other opioids); reserve concomitant use in those for whom alternative options are inadequate; limit dosages/durations to minimum required; monitor. During or within 14 days of MAOIs: not recommended. Risk of serotonin syndrome with serotonergic drugs (eg, SSRIs, SNRIs, TCAs, triptans, 5-HT3 antagonists, mirtazapine, trazodone, tramadol, MAOIs, linezolid, IV methylene blue); monitor and discontinue if suspected. Avoid concomitant mixed agonist/antagonist opioids (eg, butorphanol, nalbuphine, pentazocine) or partial agonist (eg, buprenorphine); may reduce effects and precipitate withdrawal symptoms. May antagonize diuretics; monitor. Paralytic ileus may occur with anticholinergics. May be potentiated by cimetidine. May increase serum amylase. Nausea, constipation, dizziness, somnolence, vomiting, pruritus, headache, sweating increased, dry mouth, sedation, diarrhea, insomnia, fatigue, appetite decreased, abdominal pain; respiratory depression, severe hypotension, syncope, hypersensitivity, angioedema. Formerly known under the brand name Opana ER.